1/4 mile asphalt trail meanders throughout the park around large trees that provide nice shade during the summer months. The decorative lighting for the trail provides users the option of utilizing the trail after dark. Anticipated future improvements to the park include the addition of a gazebo, picnic tables, park benches and playground equipment. 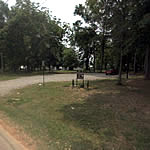 Hwy 69 South from Tuscaloosala to Greensboro; right on N. Powers St.; park on right.